A signature is the text or image that automatically appears below each post you make. This can be text or a small image (less than 590px x 200px). 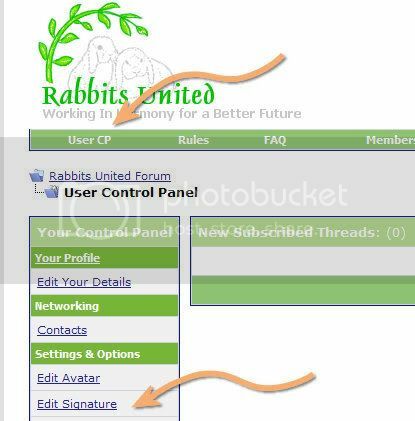 You can set your sinature in the User Control Panel accessed via the UserCP link in the top navigation bar. When you click on this a new menu appears on right with the options for your account. To edit your avatar click the 'Edit Signature' link. 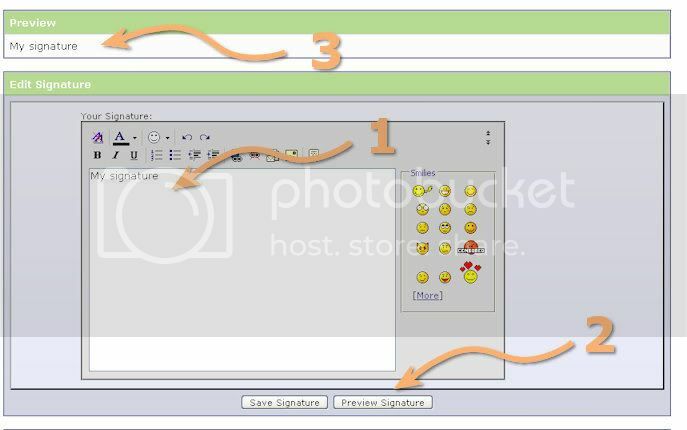 When you have entered your signature click the 'Preview Signature' (2) to check it displays how you want it to (3). When you are happy click 'Save Signature'. If you are trying to add an image to your signature and it won't work then it may be because the image is too big. The limit is 590px x 200px. If you need help with resizing an image, making your signature or want to test it please post in the help section. Last edited by Tamsin; 29-06-2008 at 10:11 PM.